With these great Mexican style recipes I have used the easy way and not always the authentic way to make them quick to put together in your slow cooker. This book is formatted correctly for Kindle devices and Kindle apps. Mexican food is so tasty and a lot of the recipes especially those with beef and beans are best cooked slowly so the slow cooker is the perfect solution. Slow Cookers have made a come back to the kitchen and are especially helpful for busy people. Slow cooking is so easy even the kids can do it. That's an idea! 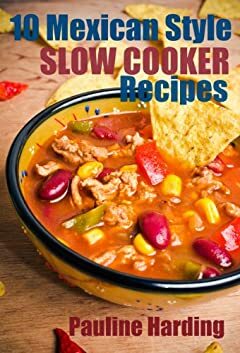 Adding variety to your slow cooker meals is so easy with these recipes which include dips, main meals like chili and soup as well as a cake to make for dessert. Click on the Buy Now button to download it now.